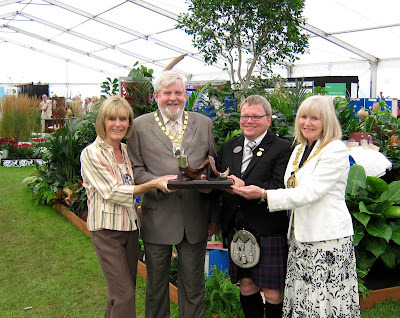 The three local councils in Ayrshire were awarded a Large Gold Medal at the 49th Ayr Flower Show for their ‘Evolution of Waste’ garden. This is the highest level of award given by the judging panel. They were also awarded the Provost Gibson T Macdonald Trophy for best municipal display. The ‘Evolution of Waste’ garden was a collaboration between North, East and South Ayrshire Councils, and was developed in partnership with the Scottish Waste Awareness Group (SWAG). The Ayrshire Councils have been working together on a joint sustainable waste management project since 2004. This good example of partnership working between local authorities will ensure that the Councils meet their future landfill diversion and recycling targets. The Councils are working together towards achieving a Zero Waste community within Ayrshire. The garden created for Ayr Flower Show was specially designed to demonstrate that suitable material collected by the local authorities in Ayrshire is recycled to form new products, working toward a Zero Waste Scotland. South Ayrshire Council Provost Winifred Sloan said: “I would like to congratulate everyone involved in creating the ‘Evolution of Waste’ garden that was awarded a prestigious Large Gold Medal and the Provost Gibson T Macdonald trophy. “The ‘Evolution of Waste’ garden is educational It will help many people to understand that all the recyclable material collected is reused and recycled. This is important to ensure that businesses and residents continue to participate in waste segregation collections. Fiona Ross, an Environment Strategy Officer in South Ayrshire Council’s Sustainable Development section designed the display garden on behalf of the three Ayrshire Councils. Assisting with the construction of the garden gave the Neighbourhood Services team the opportunity to develop and demonstrate the talents of some of their gardeners who are working towards attaining an SVQ in Amenity Horticulture. The ‘Evolution of Waste’ display had a number of waste receptacles in a jungle feel garden which showed a range of new products formed either in total from recycled materials or which had a high recycled content. The jungle equatorial concept was used to give the feeling of regeneration and rebirth. Nowhere on the planet do plants grow and re-grow as quickly as they do in the equatorial rainforests. This feature was mirrored in the garden in terms of demonstrating the reuse and recycle of waste materials into new products. The variety of products in the garden demonstrates that products made from recycled material can be high end goods from cutlery, pots and pans in the kitchen to duvets and bedding in the bedroom or clothing and bags in the wardrobe. There are currently 557 Ayrshire business stories permanently archived on this site. To locate those of most interest to you, please use the site search facility in the top left hand corner of this page. Type your search term in the white box, then click “SEARCH BLOG”.